Still looking for a pot holder that will protect you and really last? The Ultimate Pot Holders are the answer to all your kitchen needs. Made from 100% food grade silicone, they are flexible but sturdy, so you can wash them in running water, toss them in the dishwasher or give them a thorough cleaning in the washer & dryer, as many times as you like; they won't discolour or fall apart like regular cloth pot holders. The Ultimate Pot Holder combines classic design with the latest technology in silicone to provide the best heat protection and top flexibility when baking cookies, searing vegetables or cooking a simple pasta or soup for your family. 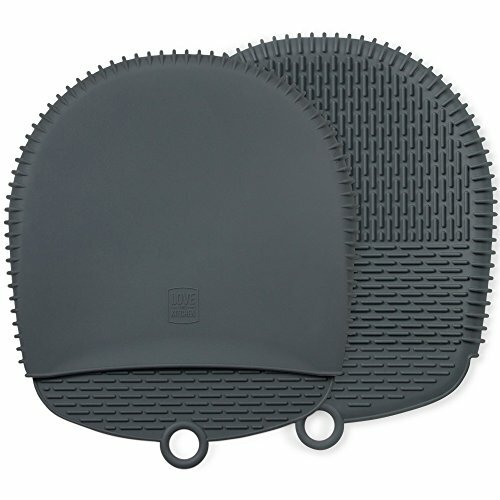 Its cross pattern offers extra protection to your hand and a firm, non-slip grip while its double face provides a pocket to help you hold on to pots and pans more firmly. ✅ NO MORE STRUGGLING WITH SLIPPERY HOT POTS - These 100% Silicone pot holders are 100% BPA free and FDA approved, food grade silicone and feature a unique patent-pending design that provides outstanding grip & heat protection, while maintaining great flexibility to grab handles, lids, pans, etc., and because you put your hands inside a pocket, they also work like oven mitts, protecting the back of your hand too! But unlike regular oven mittens, they come on and off fast and easily! ✅ PROTECT YOUR HEALTH BY GETTING RID OF GROSS, STICKY, OR STINKY POT HOLDERS - Unlike cotton pot holders and oven mitts, ours are made of FDA Food Grade Silicone and won't absorb liquids, stain or burn; grow mold, mildew, or bacteria. Plus, no matter how dirty or sticky you get them, simply rinse off, toss in the dishwasher, or even in your washer & dryer! Unlike cloth potholders, they won't discolor or fall apart, and will look brand new for years to come! ✅ GREAT GIFT FOR EVERYDAY USE - At 8 ½" long x 7 ¼" wide, with four beautiful colors (Dark Gray, Teal, Navy Blue, and Coral Red) to choose from, these pot holders (set of 2) are heat resistant, flexible and come with a convenient loop to store them! Great for camping too, they make a cute present for mom and dad, siblings, or friends who love preparing delicious homemade meals every day. It will definitely make their lives easier (they are even great for opening jars!). ✅ IT'S TIME TO STOP WASTING MONEY - How soon was the last time you threw away your cloth potholders? How many have you thrown away in the past few years? Not only are they full of bacteria, they just don't last, getting burned, stained, and just plain gross with regular use in a matter of weeks. A few trips to the washer & dryer and they fall apart! On the other hand, made of 100% Premium Grade Silicone, these potholders will last you a lifetime and are the very last pot holders you'll ever buy. ✅ 100% SATISFACTION GUARANTEE - At Love This Kitchen, we take everyday tools and redesign them to make them better, stylish, and enjoyable. By using the best materials and through extensive quality control, we create top of the line kitchen tools that are made to last. Established in USA in 2002, our promise to you is this: If you aren't 100% thrilled with your purchase, just contact Amazon within 60 days for a full refund. Plus, all our products have a limited Lifetime Guarantee. Buy Now!